Batman v Superman: Dawn of Justice directed by Zack Snyder spurred not only a battle between two DC Comics superheroes but also between critics and fans. 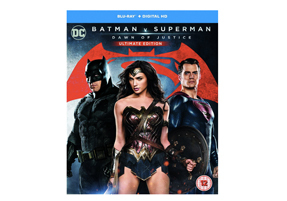 Critics reviews of the film (which stars Ben Affleck, Henry Cavill, Amy Adams, Jesse Eisenberg, Diane Lane, Laurence Fishburne, Jeremy Irons, Holly Hunter and Gal Gadot) have been predominantly poor but fans and movie goers have not been put off, as reflected in box office takings to date. 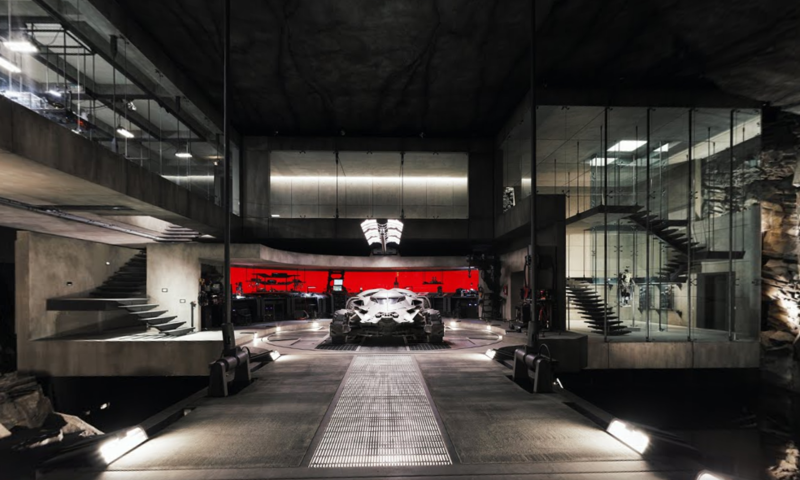 One indisputable winner however is Bruce Wayne’s house. In this 2016 Warner Bros creation, Wayne Manor has been burned to the ground, forcing Bruce to live in a nearby lake house. Google maps have collaborated with Warner Bros to bring us an exact location and 360 interactive tour of the house (tour no longer live) in Orion Township, Michigan. And what a lake house it is to behold! Perfectly befitting of an older, sophisticated Batman. 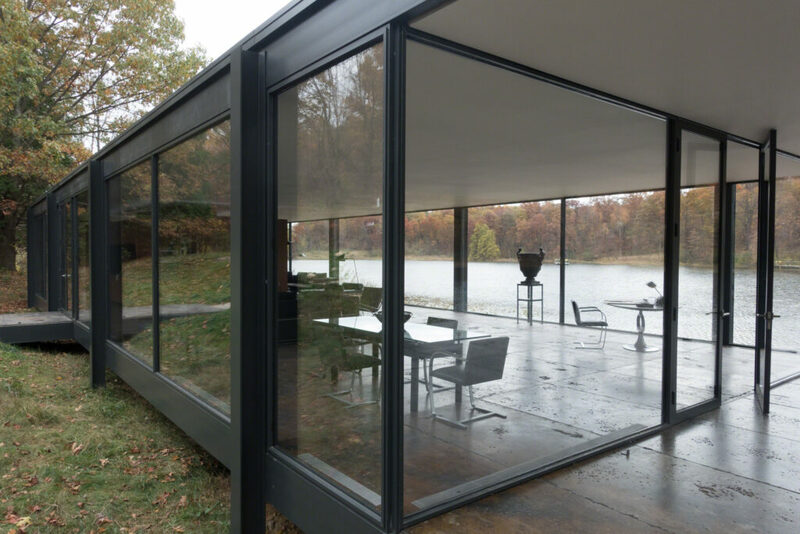 The Google maps 360 tour took us from street view of the residence entrance located 40 miles north of Detroit to inside a modernist architectural masterpiece (Update: the 360 tour is no longer live but stills and screengrabs of the tour are below for your viewing pleasure). 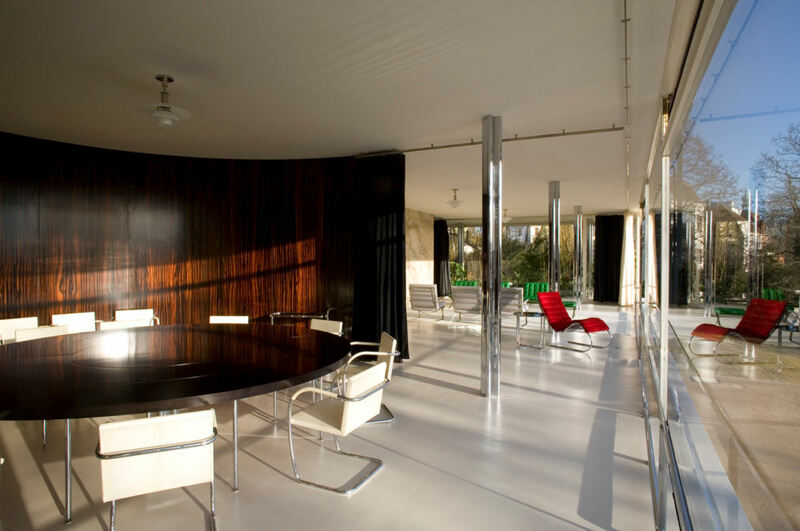 The house looks like a classic design by the German architect Ludwig Mies van der Rohe whose famous Villa Tugendhat in Brno, Czech Republic was one of the pioneering prototypes of modern architecture in Europe designed in 1928-1930. 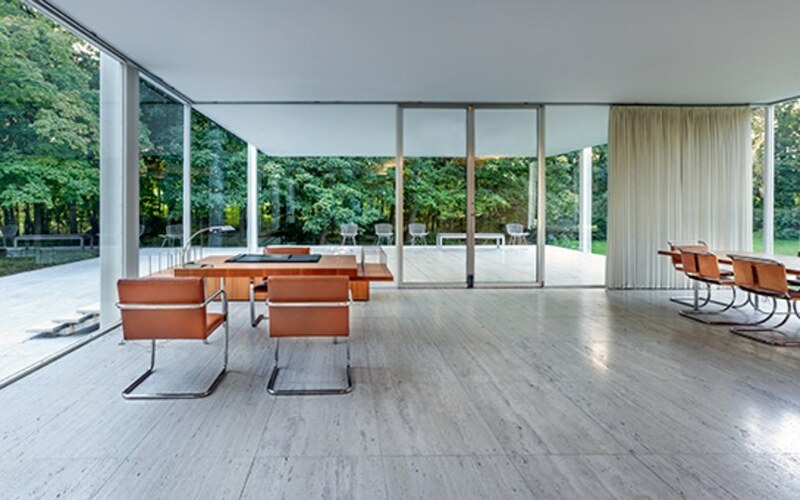 Wayne’s house however is perhaps closer in size to the highly regarded Farnsworth House, also designed and built by Mies between 1945 and 1951. 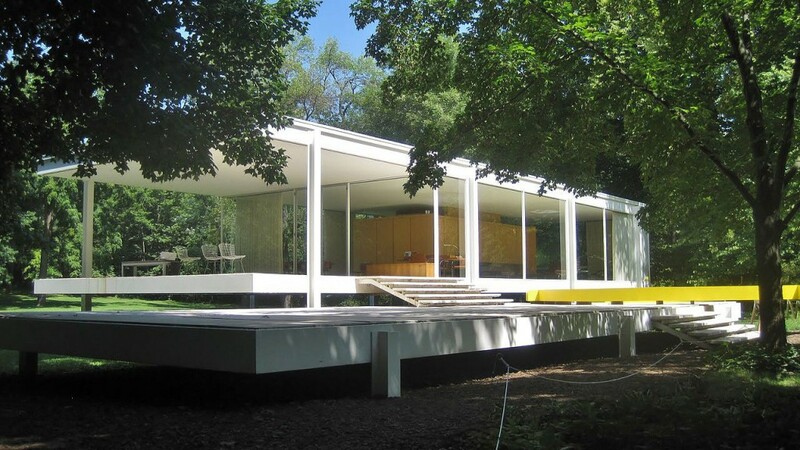 A weekend retreat in a once-rural setting, The Farnsworth house is located 55 miles (89 km) southwest of Chicago’s downtown on an estate adjoining the Fox River, south of the city of Plano, Illinois. 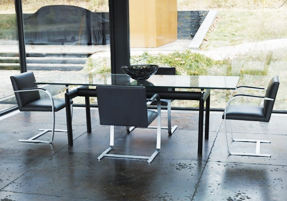 The Brno chairs which sit around Bruce Wayne’s dining table are covered in black Italian leather. 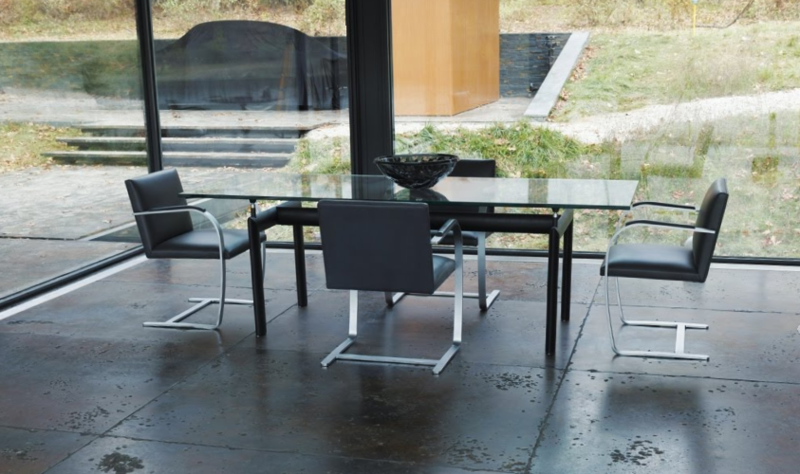 The frames are made from high quality solid stainless steel. 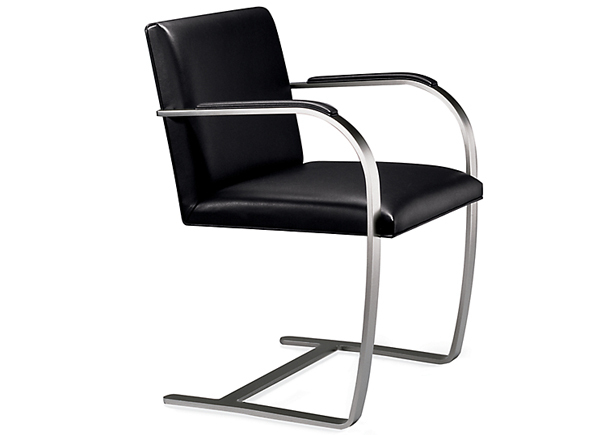 Designed by Mies van der Rohe in 1930 for his renowned Tugendhat House in Brno, Czech Republic, the Brno chair reflects the simplicity of its original environment. 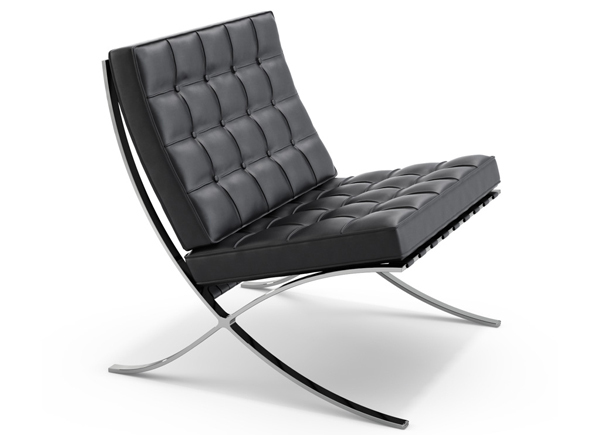 The chair has become an icon of 20th century design with its lean profile, clean lines, and attention to detail. 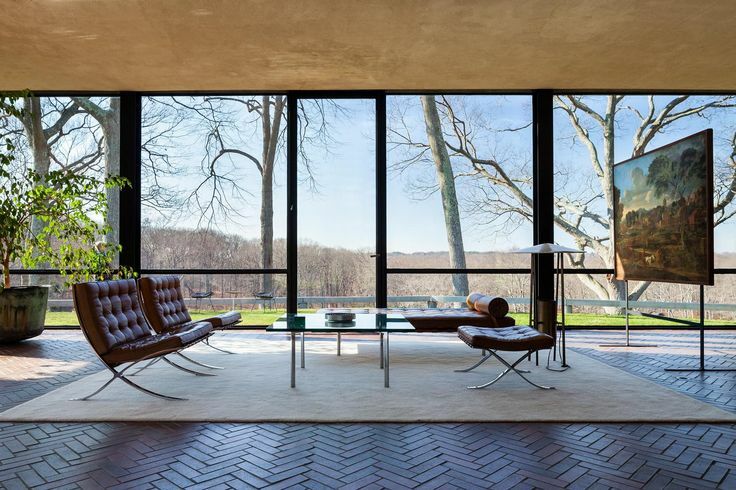 Wayne’s residence is also remarkably reminiscent of another important modernist building – the Philip Johnson Glass House. 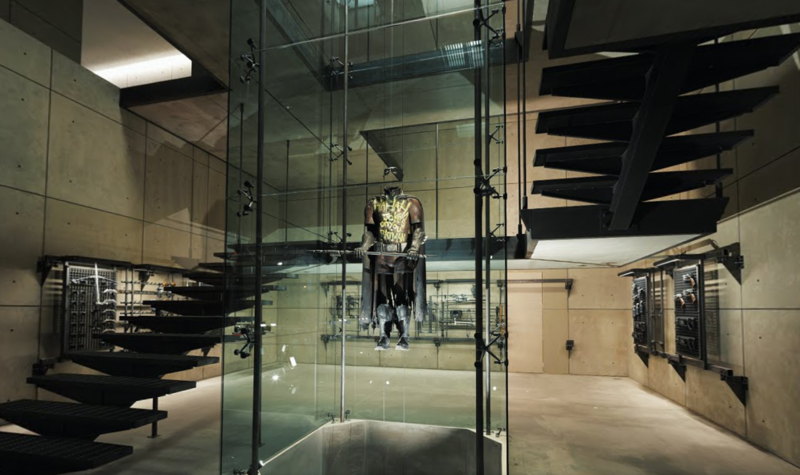 After taking the Google map tour around Wayne’s open plan single story residential abode (complete with car port visible outside) we enter a dark corridor to discover the Batcave which contains the Batmobile, an armoury, a glass-cased Robin outfit (bearing a message from the hand of The Joker) and the high tech HQ. 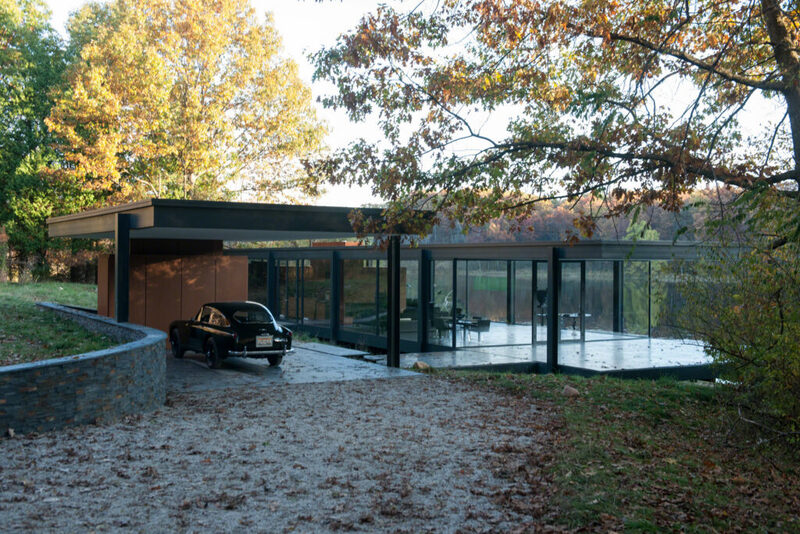 What’s particularly interesting about the choice of a modernist house leading to a Batcave is that one of the most revered and influential modernist houses – Philip Johnson’s Glass house – was designed with an adjacent underground bunker for Johnson’s own art collection. Someone did their twentieth century architectural homework when considering the frontage for the Batcave it would appear! Wayne’s abode reveals a dark, muted and sophisticated palette of black, grey, wood and stone together with several furniture classics. 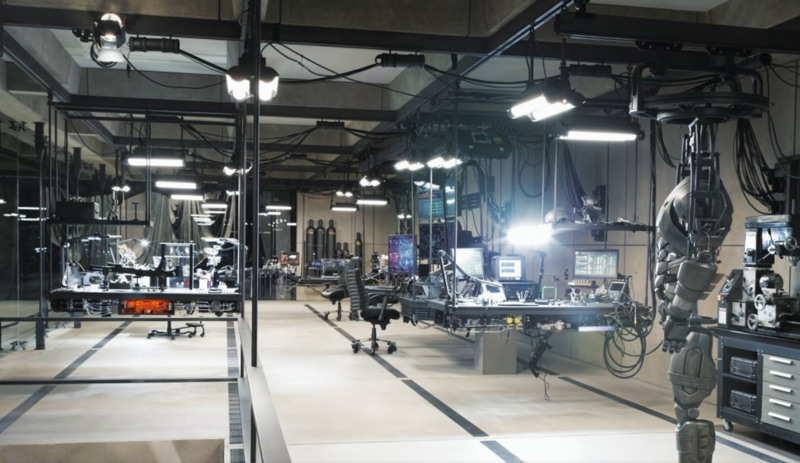 Bravo to Batman v Superman production designer Patrick Tatopoulos and set decorator Cal Louks. 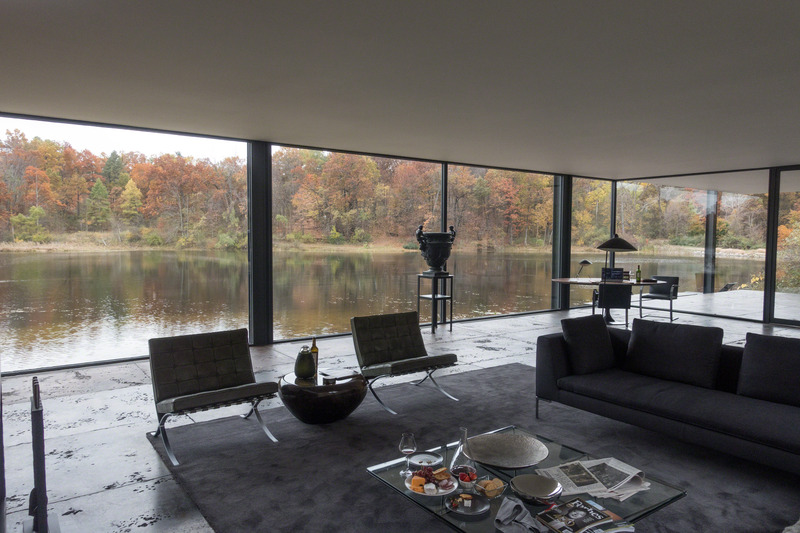 Batman v Superman: Dawn of Justice stars Ben Affleck as Batman / Bruce Wayne and Henry Cavill as Superman / Clark Kent in the characters’ first big-screen pairing and features an outstanding nod to modernist architecture and furniture in Bruce Wayne’s lakeside house. Excellent article, I really enjoyed reading this. 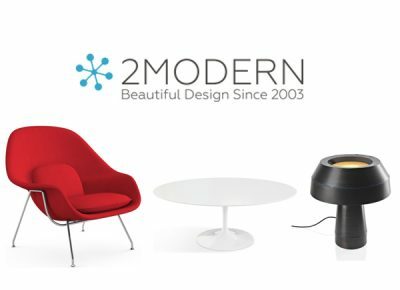 Do you have any idea what the steel pedestal tables are? They appear to be bolt down, I don’t recognise them. 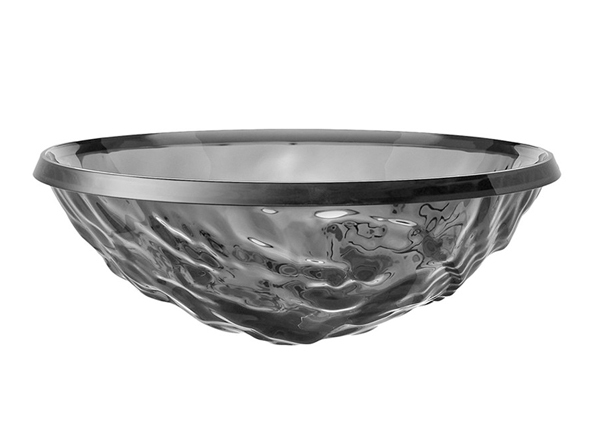 I also noticed a grey Kartell “Moon” bowl on the dining table. Any thoughts on the occasional tables near the fire? I’m fairly sure the fire tools are by ‘Pilgrim Art’. Hi Dave, glad you enjoyed the article. The steel pedestals have us stumped I’m afraid. Possibly custom made. 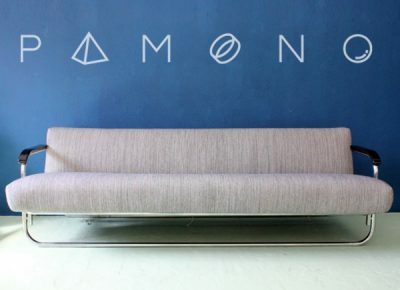 Well spotted on the Kartell Moon bowl -thank you and we have updated the article accordingly! we love it when eagle eyes spot things we missed. 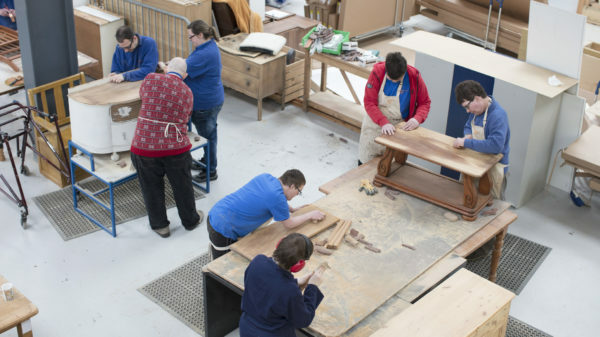 The tables near the fire – do you mean the taller one to the left by the logs? or the lower coffee table on the rug? 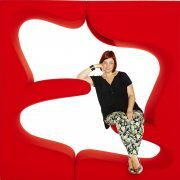 Hi Paula, it’s a great article – I’m amazed at how right the set designers got this house. I actually like both tables near the fire, so I’ll have to investigate. 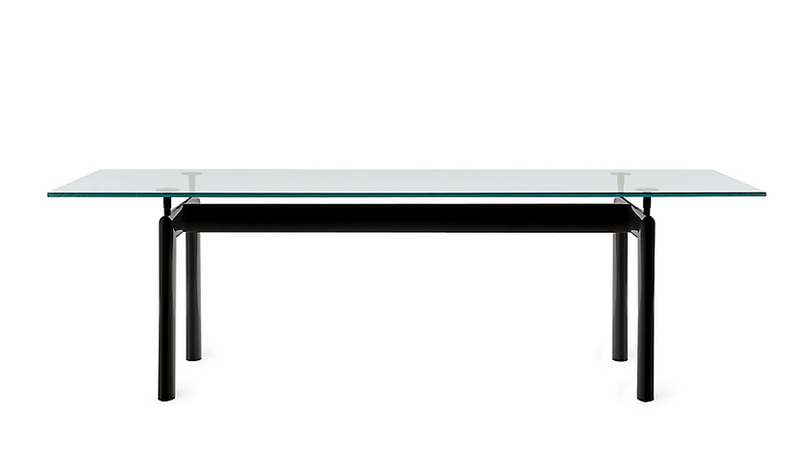 The dining table looks like the LC6 by Le Corbusier. 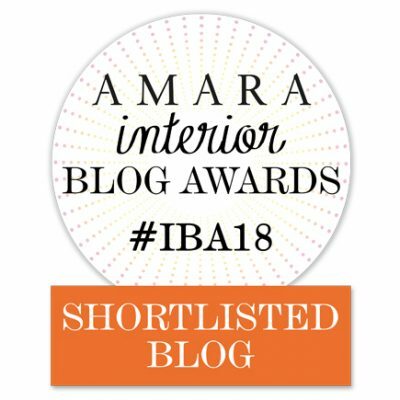 I’d love to see the kitchen, if they made one! Ah yes, would love to see the kitchen also. I am sure it would be mainly stainless steel. Perhaps Balthaup. Truly modernist kitchens in the Bauhaus sense don’t get much of a look in. I was in Erno Goldfinger’s kitchen at Willow House last week and it is the size of a postage stamp. Good luck on the dining table investigations. Please share your findings if they are successful! 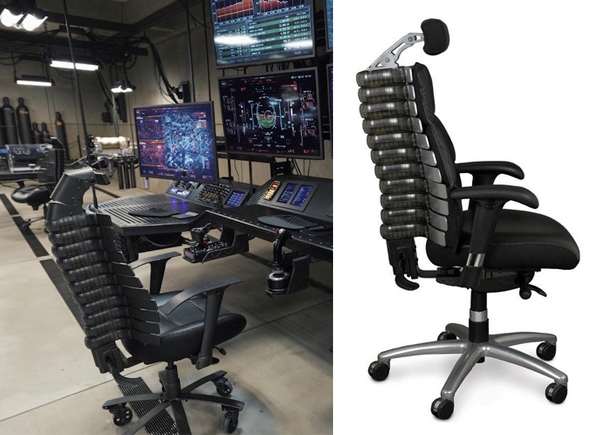 Do you have any idea about the black “spines” chair Bruce Wayne used on the batcave? I was wondering where to get the chair in the batcave. Can you help with that? Hi. Yes we do know what the black chair in the batcave is! and where to buy it. 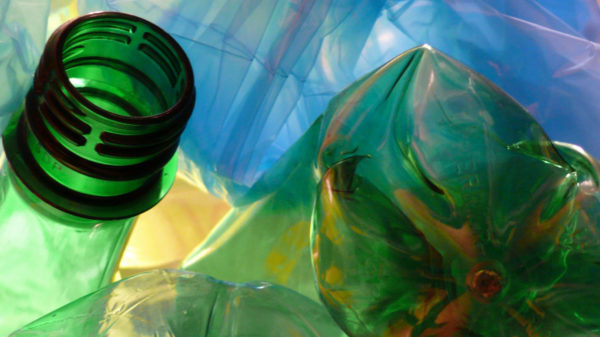 We’ll be doing a post on that very soon – so stay tuned! (and sign up to the newsletter from “subscribe” in the menu, to stay in touch). hello how to know wheer we can buy this black chair pls?? Where can I find the walnut square bowl on Bruce Wayne’s desk? I would love to have something like that as a valet tray. 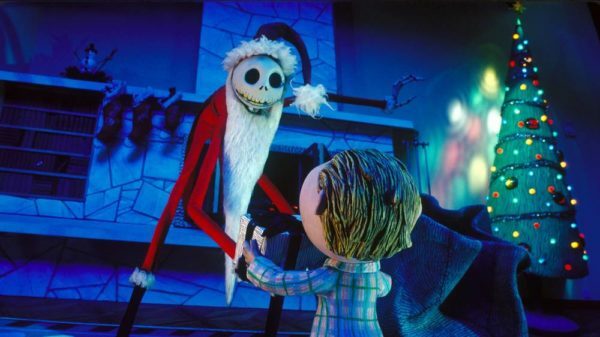 Hi Johnny, We’re looking into that walnut square bowl for you – have put a shout out to the films art team and will let you know when we hear back. If a person has a private lot to build on, this could be a great home. I’m sure that I can’t be the only one who would enjoy building one of these for themselves. I wonder if a set of plans is available for purchase? Would love to build this house! 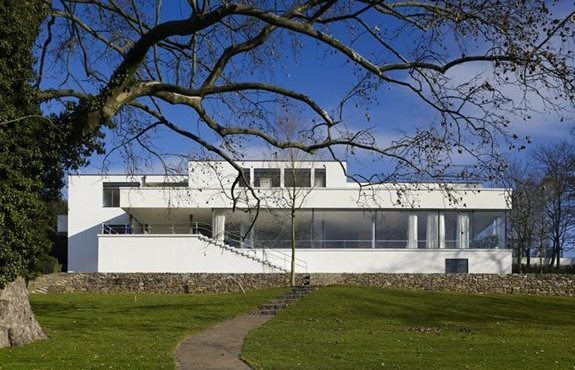 As it’s based on The Farnsworth house I’m sure you could find the plans for that. Try Farnsworthhouse.org. What kind of glass is used here ? which glass do you mean Tony? Artistic licence for the film I guess! 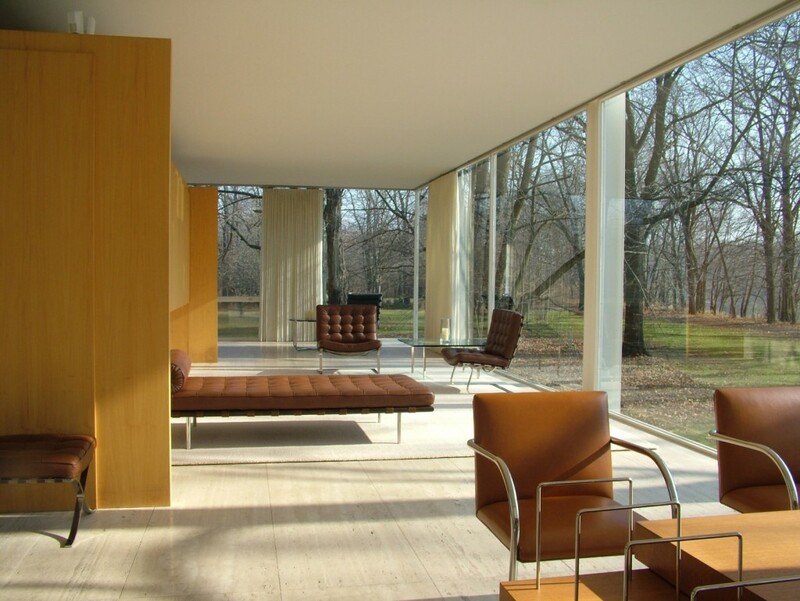 It does echo so well how the land around the Farnsworth house frequently floods.